Chess coaches and clubs finally have an all-in-one supplemental toolkit for their chess programs that is affordable, easy to implement and essential for managing students. These tools are the perfect complement to over the board training, and most of our coaches agree that they are a necessity, not an option! "Report cards keep you updated on your student activity and progress!" Measure and track the progress of your students, using Report Cards, lesson progress trackers and other tools. 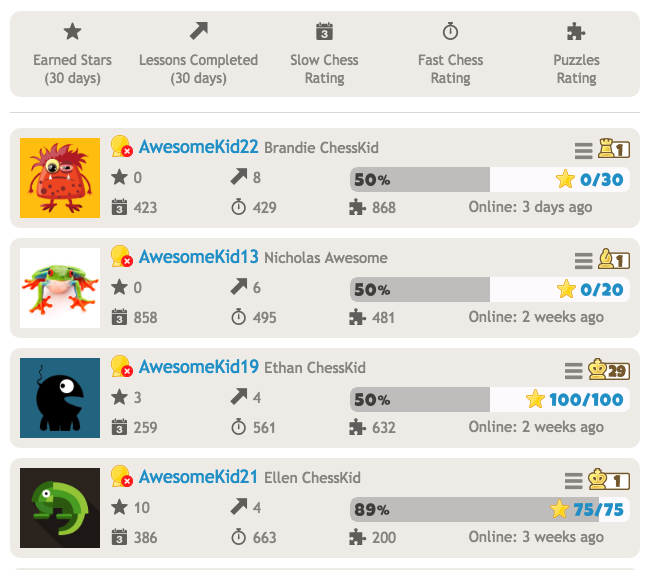 With ChessKid tools, measuring and assessing your students’ progress is a breeze, and with all games and activity saved on the site, it's easy to analyze individual games over the board as well as show parents just how much their kids are learning and progressing! The Club Management tools allow for better organization, while Club Leaderboards motivate students to improve. "Club Leaderboards are great motivators for students!" Whether you’re a teacher or club manager, ChessKid gives you the tools you need to seamlessly run a club of 5 kids or a school of 500. Want to get started? 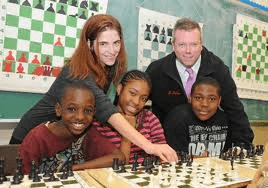 As a grandmaster and professional chess coach for more than 20 years, I highly recommend ChessKid's training tools for every chess club and after-school program in the country. Hall of Fame Chess Player, Author, Grandmaster and Coach. Chesskid is one of the best instructive websites for kids who love chess. It's easy to navigate, fun, and has lots of instructional content for all levels of player. One of the best things to happen to the game of chess in the 21st century is ChessKid. I am privileged and pleased to be a part of this wonderfully comprehensive and state-of-the-art service. National Master, Renowned Chess Author and Coach. ChessKid in Charlotte, North Carolina. Chesskid has been a great tool for the Charlotte Chess Center because it provides our students with all of the resources they need outside of class. With videos and articles written by the best coaches and players, the resources are second to none. 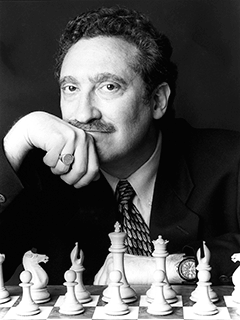 National Master, Professional Chess Coach, and Founder of the Charlotte Chess Center. Using our parent company, Chess.com, with high school students in Winston-Salem, North Carolina & around the world! I coach the largest high school chess team in the state of North Carolina: Atkins HS in Winston-Salem, NC. The large number of students poses a challenge, and so learning and playing on the online, interactive Chess.com website became a key part of our program. Recently, as a part of the Sister Cities International organization, we arranged global chess play with students from other "sister cities" around the world. 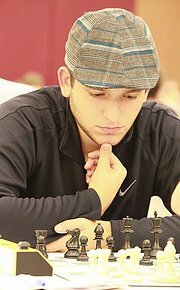 Chess.com makes all of this possible, as students in North Carolina (US), the Bahamas, and Moldova started this global chess initiative. My players love the live play, the online play, the lessons, and the tactical puzzles. 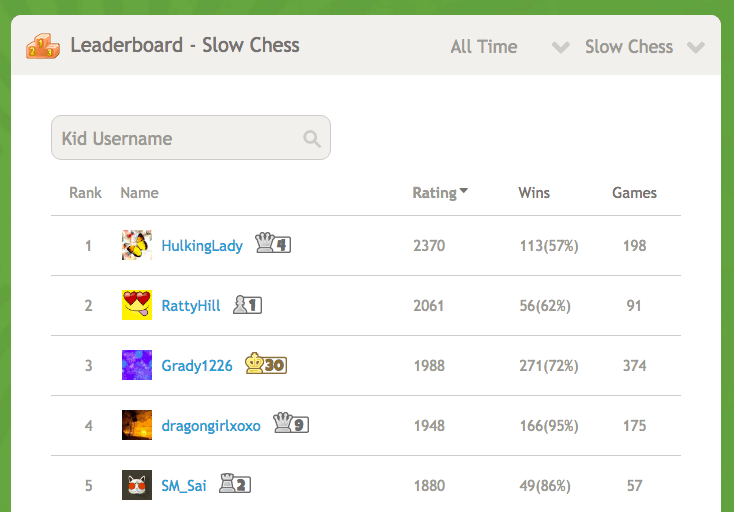 I can't thank Chess.com enough for having such an affordable way to build the skills of chess players of all ages and abilities. 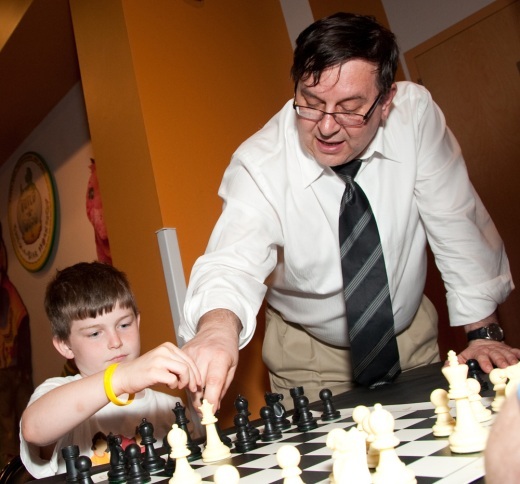 You can read about our Global Chess Partnership on the Winston-Salem Sister Cities site. Chess Coach, Atkins Academic & Technology High School. Using ChessKid in Cairo, Egypt. I am writing today to let you know that one of our kids won the bronze medal in the national chess championship under age 8 [Egypt]. At Chess Your Child, we train our kids based on the study plan you include in ChessKid. Your plan is rock solid and it builds champions. Thank you very much for all the efforts you do at Chess.com and ChessKid.com. Keep on spreading the beauty of chess.